The call to sustainability has been growing over the last few years amidst report of the worsening condition of the planet that we live in. And, one of the main contributors to climate change is power plants, especially if they run on fossil fuels. Fossil fuel powered power plants release a large amount of Carbon dioxide gases which is one of the main causes of global warming. It also requires a copious amount of water to cool it down. In addition to all of these, mining fossil fuels destroy large tracts of land that in turn affects the ecosystem of that particular area. Statistics show that currently, 79% percent of the world’s power plants run of fossil fuels. However, this number is expected to go down with the rise of renewable power plants that are already starting to crop up. But, then, the decline of the use of fossil fuel power plants might not be fast enough to offset the environmental impact that it has already done. The question is, what can you do to help? For starters, you can conserve electricity, or maybe you can also think about supplementing your electricity usage with off the grid renewable power options. Most people think that powering your home with renewable options involve bulky equipment and also having to leave the convenience of living in the city. But this is not the case today. With new advances in technology, renewable energy options have become sleeker and smaller and can also fit in any type of residential area that you currently live in. Here are four green ways to power your homes this 2019. The wind is sustainable energy that's free and abundantly available. This energy can be used to power an electrical system thru the use of a wind turbine. Compared to the bulky wind turbines of the past, modern wind turbines are smaller and can be installed in a residential house. There are some requirements that you need to have so that you can install one: you have to live in an area where there is abundant wind, and at least have 1 acre of land. 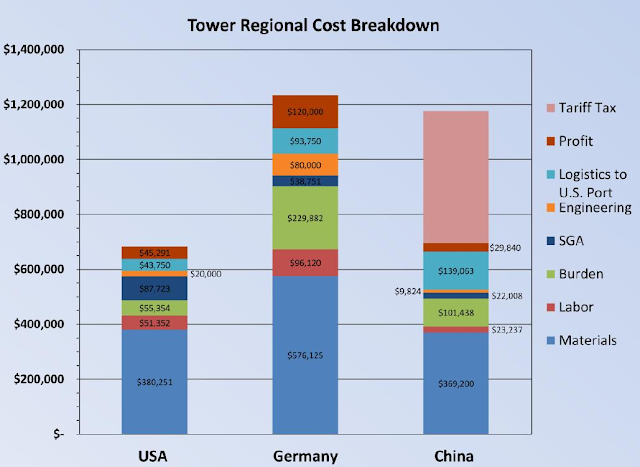 A 10Kw wind turbine cost between $50,000 to $60,000. Admittedly, it is a big initial investment. But, a 10kW wind turbine can generate about 16,000 kWh of energy per year which is more than enough to power an entire home. If you think of it this way, then your investment will pay for itself in about more or less six years. Since this is renewable energy, there are tax incentives that are offered which can be anywhere from 12 to 30 percent depending on the country that you live in. Currently, countries like the USA, China, Korea, Belgium, Ireland, and Spain offer tax incentives for renewable power sources. The sun is another source of a renewable source of power that can be harnessed through the use of solar panels. But, a lot of people don't want to use it because it costs a lot and it can be very bulky. But the new kinds of solar panels are smaller and are cleverly disguised as roof tiles. These are known as photovoltaic roof tiles or simply solar shingles. These photovoltaic tiles like Tesla's solar roof tiles not only look better than normal tiles, it is also tougher. Solar roof tiles can be retrofitted into your existing roof. Or if you are building a house from the ground up, it can be integrated into the construction drawings. It should be easy enough to do especially if your construction firm is modern and uses the latest tools like construction management programs and engineering drawing management software. The kind of system will set you back anywhere between $20,000 to $50,000 for a 2500 square foot home (232 square meters). Of course, it could be more or less depending on if you want it to cover your entire roof or just a portion of it. Renewable energy like solar power is eligible for government incentives depending on where you live. So, check with make sure that you check your local government on which incentive can be available for you. If you are one of those people who is thinking if there is a way to completely depend on renewable sources of energy to power your house because due weather fluctuations, you can't always have the wind to power the turbine or the sun to store energy via solar panels, the good news is there is. If you want to go 100% green in powering your home, you might want to consider having a solar/wind hybrid system. 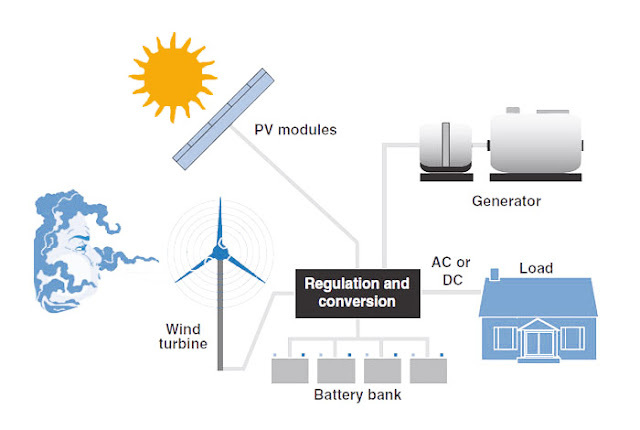 This is exactly how it sounds like- system which is a combination of both solar and wind turbine. This system is more reliable because it doesn’t just rely on one source for power, and is cheaper as well because it uses smaller components for each part compared to what would be needed if you go all solar or all wind. A hybrid system that can generate about 7.5 kWh of energy per day starts around $35,000. Air-conditioning is one of the things that eat up a lot of power especially during the summer and winter. One of the greener options that you might want to check out is installing a Geothermal heat pump in your house. 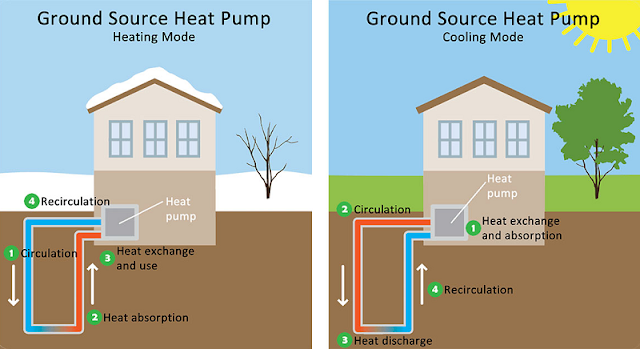 A geothermal heat pump is basically a heating and cooling system that uses the earth as a source of heat in winter, and the earth as a heat sink in summer. This type of system can be easily integrated into the HVAC (Heating, Ventilation, Air Conditioning) system that you already have in your house. This type of system works a lot like the refrigerator that you have at home. It transfers the warmth from the ground into your house thru pipes that are filled with water or antifreeze solution. These liquids filled pipes are then installed to the geothermal heat pump which in turn acts like a heater or air conditioner depending on the need. New technological advances renewable energy sources have now allowed ordinary people like us to have an option not to depend totally on big power plants to power our houses. And while the upfront costs are undeniably expensive, it is expected that in the near future when systems like the ones mentioned above become more and more common that the prices will become more affordable. But with price aside, it is good to know that if we really want, we do have literally the power in our hands to help the Earth recover by choosing green energy. For business related articles, you may please check our business section.